Earlier this year, the Simon Leadership Alliance began facilitating FreshBiz. 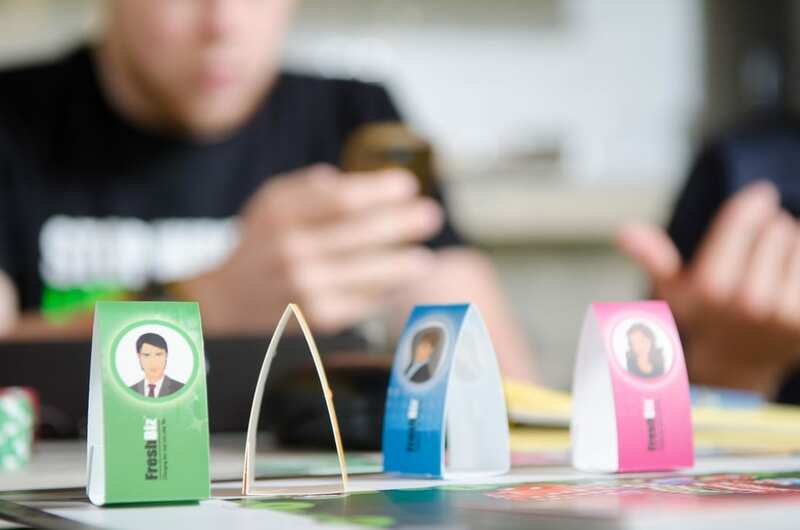 FreshBiz is a 90-minute board game that you can only win if you collaborate, leverage smart thinking, and fully express yourself. In fact, it’s more than a board game. FreshBiz is an experience, in which each person transforms into a New Entrepreneur. The New Entrepreneur looks at life as a game, in which he/she understands the gaming dimensions he/she created in his/her life, defines what winning looks like, and changes the way he/she plays his/her own game. New Entrepreneurz leave after the FreshBiz experience with new takeaways in leadership, a new mindset and a new language to bring to their teams. New Entrepreneurz join a new tribe of game changers focused on smart businesses that encourage innovative thinking and taking action, now. It’s an experience that has instilled new ideas for me to change my own game every time I’ve watched others play, played myself and read the book. After playing the FreshBiz game, and reading the book The New Entrepreneurz written by FreshBiz founders Ronen Gafni and Simcha Gluck, I understood what they meant when they said FreshBiz is more than a game. FreshBiz is an experience. I discovered that this experience, transforms teams into tribes of like-minded thinkers. It gives them a language and mindset that sets them up to have new and innovative ways to solve problems and become highly successful in their mission. These tribes of thinkers are all over the globe and now span over 60,000 people who have experienced FreshBiz. These tribes are making changes both in the way business gets done and how they live their lives. FreshBiz takes a fresh look at business, entrepreneurship and life with a new school approach. We are just now beginning to grow this tribe in San Diego and I look forward to see the impact this has on business and lives here. After going through the FreshBiz experience and watching and filming over six other companies go through the FreshBiz experience, I have left every workshop with new goals to change my game. My game involves looking at the different layers of my life and really define what winning my game looks like. We all have multidimensional roles in our lives, and FreshBiz has helped teach me to embrace my multiplicity. My roles in life include being a mom, a military spouse, a sister, daughter, neighbor, an esthetician and, yes a leadership enthusiast. My many hats don’t have one name, but what FreshBiz has taught me is that they don’t need one name. This new mindset has enabled me to see all of these dimensions in my life in a whole new way. My hope is that you can connect with what I’ve learned from this experience and want to learn more about joining this tribe that will begin to help you to see your life, your career, and your family in a new perspective. So here are three ways the FreshBiz experience has changed my game. In FreshBiz, your action cards are the unique gifts and talents that you have to share with the world. (In most cases, we hoard our actions cards denying the world our gifts and our full self-expression.). In the game, like in life, you are allowed to play your action cards at any time, but most people tend to hide their action cards and rarely use them. Hoarding your action cards in the game of life actually slows your progress, causing you to play a small game of life. In the business environment, entrepreneurs are experts at sharing their action cards. By freely sharing and playing their action cards, they are experts in playing a bigger game. When you can define what your action cards are, and learn to use them in real life, you can really leverage resources and exchanges much easier. Yet, as individuals, we hold back our action cards. Before this experience, I was clearly a hoarder. You’ve clearly identified those of others. You have a keen sense of their different values, depending on who’s using them. After learning about how I should use and share my personal “action cards,” I started doing things I had never even considered before. By witnessing others play the game, I identified the first action card I could use at work. As the social media manager, I had never considered filming or taking photos of our trainings. Yet, I create content to share on our social media sites nearly every day. The night after my first FreshBiz experience, I dusted off my husband’s camera and made a commitment to film when I had the chance. At first I wondered if this was considered an action card, because I doubted that my rookie camera skills would be considered a talent. But now I see how just starting somewhere, taking one action that prior to this experience I had never even considered, has benefited us. Practicing recording, and video editing has enabled me to create amazing content to connect with others and share our passion in leadership with others. Now I often think about what my action cards are and how I can share them with others, whether it is with a neighbor, friend or stranger. If I can help, I just do it. Not to get credit or with the expectation of receiving something back, but for the gratification of knowing that I am sharing my unique talents with others that need it. As leaders, we need to remember that everything we do affects our mind-set and the mind-set of the people around us. The mindset that FreshBiz teaches is a mindset that goes all-in, a dedication that focuses on giving 100% of yourself to your health, your education, your relationships, your work, and even all in financially. Ronen, the cofounder, literally sold his house to print the first 1,000 FreshBiz games. He was willing and able to do this because he changed his mindset about what a home is. To Ronen, a home wasn’t about ownership anymore, but a place where you get to live your full potential. He felt that selling his house and choosing to rent was making that possible. This ultimately has led to a valuation of the FreshBiz company to soar way past the price of his home. All it came down to was a change in his mindset that had helped him reach his dreams. After learning how smart business is defined in FreshBiz, I was excited to see that there was actually a term for what I had been searching for during my job search after college. It serves a higher mission with your unique voice. It demonstrates Win to the Winth Power. The FreshBiz experience challenges you to think about your higher mission and really focus on what your unique voice is. Ronen & Simcha believe that business is meant to be an extension of your own self-expression, which confirmed to me that being in leadership training is absolutely where I am meant to be. My higher mission in helping others develop and grow. Having the ability to be authentically myself at work aligns perfectly with our mission at the Simon Leadership Alliance. At the end of the day, is what you do what you love? Does your work challenge you to bring your uniqueness to the work? If you’re not setting up your life to challenge yourself and use your unique talents, then what are you doing? Smart business focuses on Win to the Winth power, which is a multiplication of the win-win concept. In games, business and in life there are opportunities to make one move and not only have it be a win-win for two people, but also win in many other dimensions. We see this in the new successful business models that focus on being a for-benefit rather than for-profit. Company models like those chosen for the Game-Changers 500 with companies like Toms, Seventh Generation, and Patagonia are purpose focused and mission driven to not only deliver high quality products, but ensure that every dynamic of their work benefits their people, profit and the planet. This highlights how companies can win by selling an incredible product or service, while also taking excellent care of the environment and their people. That’s Win to the Winth power. I see the Win to the Winth power concept play out every time we complete a training session or workshop. The delivery of one session delivers wins in many ways. I win because I am able to grow and learn through helping Mitch develop and refine the content, activities and workbooks for the sessions. Mitch wins through his delivery of the workshop as he grows on mastering his skills in facilitation and speaking. The participants win because they are learning more about themselves and others in the session. Then, their coworkers win as the participants practice what they learned outside the session and bring new leadership practices into their business. This in turn, helps their business also win at accomplishing their unique mission. One leadership session results in five wins, or Win to the Winth power. One main element in most people’s definition of lifestyle often involves becoming the best version of yourself. Is your work helping you become the best version of yourself? If it is, than it is supporting your lifestyle, if it isn’t than it’s worth making that a possibility. After the FreshBiz experience, I realized that choosing my work in leadership supports my lifestyle, and has helped me dig deeper by asking, well, what is my lifestyle? What does my ideal life look like? Every day I get better at living my good life and more specific in defining what that looks like. Along this nine month journey of digging deep into the FreshBiz experience I can truly say that it has transformed my mindset, my relationships and my life in incredible ways. If you would like to learn more about FreshBiz and the concepts that I’ve shared, and learn some more about this mindset, you can connect with us on LinkedIn, Facebook, or Instagram.